What is a Goassnmass, Leyla Kazim? Munich is visited by many influencers throughout the year who capture the city through videography, blogging and photography. To get an impression of their creative work and find out what they liked most about Munich, we provide a questionnaire. This time: Leyla Kazim from London, Content Creator and face behind the travel and food blog „The Cutlery Chronicles“. How had you imagined Munich before your visit? Very beer and sausage based! Beyond stories about Oktoberfest I'd heard from friends, I didn't really know what to expect from Munich. And how did it turn out to be? So much more. Munich is a city where traditional and modern sit side by side like few other places. The city is full of so much culture, an amazing cocktail scene, exquisite architecture, spectacular palaces and it's also a really good place to shop. The beer is still great too, of course. I like to get up high in a new city, above the rooftops. So I'm always on the lookout for good vantage points. There are a couple of fantastic ones in Munich: at the top of the steeple of St Peter's Church, and at the top of the tower of The Neues Rathaus (New Town Hall). They're close together and give different views over the central square of Marienplatz. If you can time your ascent up the steeple in time for the chiming of the Rathaus-Glockenspiel (11am and 12pm every day, plus at 5pm during the summer), then even better! What was the most interesting place? The most interesting and beautiful library I have ever been inside is in Munich: the Juristische Bibliothek (The Law Library) inside Munich’s town hall. It must be one of the most stunning in the world! The best way to see it is to go on a guided tour of the town hall which you need to book in advance. Well worth it, as the whole building is really impressive. What was the tastiest food? What was the best drink? I had a fab schnitzel at Spatenhaus an der Oper opposite the Bavarian National Theatre. 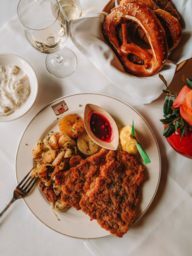 Even if the portion was absolutely huge – basically two big schnitzels with potatoes and pretzels, for lunch! I also had a really excellent New York style cheesecake at brunch favourite Occam Deli. For a great cocktail you should head to Bar Gabányi on Beethovenplatz, where the owner, Stefan Gabányi, is considered one of the country's leading whisky experts. It's one of the best bars in Munich for cultured drinking and the fine art of cocktails. What was your nicest encounter? I spent a wonderful couple of hours chatting to Rahmée from Noh Nee, where they design and create traditional Bavarian dresses (dirndl) with African high quality fabrics. I even got to try one of these exquisite dresses on – they're truly stunning! Probably when I stepped into the Antiquarium banqueting hall of the Residenz palace and exlaimed 'OH MY GOD!' – it is that spectacular! 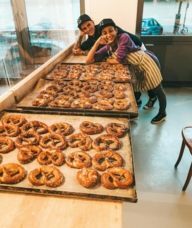 How to make pretzels! I spent an awesome morning with Tom the Baker learning how to make this quintessentially Bavarian baked bread. It was heaps of fun and I'm sure they tasted even better than usual because I'd had a hand in making them. What did you take from your visit? It is a city I'm not going to forget any time soon and that I'd love to return to explore more of it. You can give your friends three tips for a trip to Munich – where do you tell them to go? I can give them 25 tips! Here's a blog post I wrote. 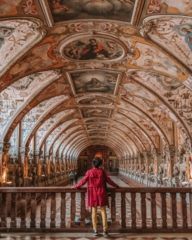 But if I had to choose three, I'd say don't miss the Residenz Palace, going up the steeple of St Peter's Church and trying some traditional Bavarian food at Spatenhaus an der Oper. A few people mentioned I need to check out the Olympiaturm next time. And I'd also love to catch a performance in the Cuvilliés-Theater, arguably the most beautiful Rococo theatre in Germany. Which photo of Munich got the best response from your followers? The one of the Juristische Bibliothek (The Law Library)! And which photo do you personally like the most? Why? Probably the one of me trying on an African-inspired dirndl from Noh Nee, because it is very rare for me to put on a dress and heels! What are your three golden tips for travelling? Ear plugs and a travel pillow, both of which I often use in hotel rooms, too, if they're noisy or the pillows are too high or hard. A good night's sleep is essential for packing in a full itinerary and making the most of your trip. Also, if you like to take pictures, edit them as you go. If you get back home with 1000 photos that haven't been touched, life often gets in the way of you ever going through them. So better to do so while you're there. And last but not least: What do you think people from Munich mean when they say „Goassnmass“? Any ideas? I'm going to take a wild guess and say it's something to do with beer? *in the Bavarian dialect, Goassnmass means a mixed drink of beer, coke and cherry liqueur. So Leyla wasn't wrong at all! I'm a content creator specialising in food and travel, and the person behind the online persona The Cutlery Chronicles. I created my little corner of the internet back in October 2012 in the form of my blog – it was always intended to be a personal anthology charting the places I visit, the cultures I experience, the food I eat, and the impressions they make upon me. I was brought up surrounded by exceptional cooking from my Mauritian mother and Turkish-Cypriot father; appreciating the huge range of flavours available in the culinary world is something I actively seek out and happily partake in on a daily basis. And so, naturally, I spent the best part of 2015 on one big 8 month-long trip, eating my way around the world. What's the biggest challenge for your work? As a big part of my job involves social media, there's a real risk of spending too much time looking at or though a screen. One of my new year's resolutions this year was to do less of that and I think I'm doing OK with it! My work focuses around travel and food. I'm particularly inspired by learning about new cuisines, food traditions and seeing how things are grown or made. I also love old world architecture and nature – anything to do with plants and animals always inspires me!